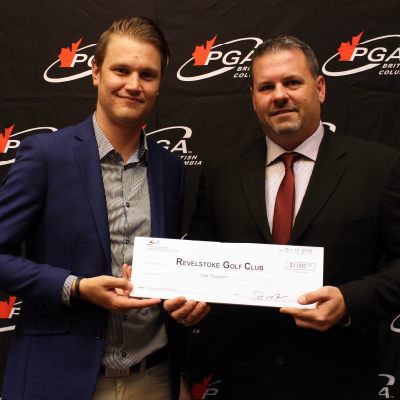 Each year, the PGA of Canada awards scholarships to help further academic achievements. Scholarships are available to members and their children and grandchildren. More information is available under Scholarships in the Members section of our National Website (click here). In honour of the late Jim Gibson, the PGA of BC is proud to affer an Award in tribute to the commitment and dedication of the longtime Association ambassador. The award will be given annually to an individual within the PGA of BC community that best exemplifies volunteerism and demonstrates dedication to furthering their education to benefit others in a community. Stashuk, who received his CFM designation in 2017, took the reins of Capilano's junior program this year and has placed emphasis on providing on-course experiences for youth aged 10 and under. He is currently enrolled in a three-year, business-management program through Athabasca University. Making a further commitment to professional development, Stashuk will be attending the renowned Coach Camp taking place in Savannah, Ga., in December 2018. 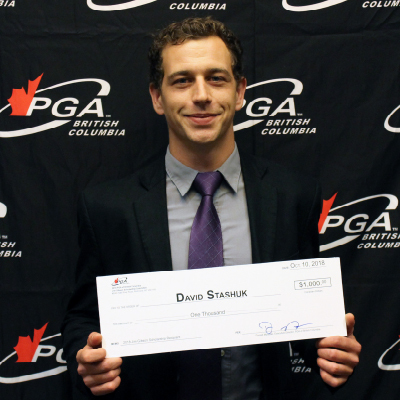 The PGA of BC Community Leadership Bursary is awarded to an individual or member facility within the Association demonstrating an extraordinary desire and passion to make a significant difference in the lives of those around them, and in doing so, sets an example of “giving back” that all PGA of BC members can be proud of. By launching a Community Junior Program in 2017 that provides free memberships to local residents under the age of 19, the club has seen its youth participation soar. Revelstoke had fewer than 20 junior members prior to the program's implementation, but the club boasts 140 juniors within its membership this season. The Community Junior Program also provides complimentary clinics on Monday evenings through the spring months. Bursary funding will be utilized to support this program and its terrific work in making golf accessible to all Revelstoke youth. The next application period for the Jim Gibson Scholarship and the PGA of BC Community Leadership Bursary will open in the summer of 2019. Please direct any questions to PGA of BC Executive Director Donald Miyazaki at donald@pgabc.org.